First off, I didn't mean to take the entire week away from the blog last week! If you hang with me on Facebook (would you like to hang with me on Facebook?? ), then you know that I spilled tea on my laptop. Oopsie. Andrew mandated a couple of things - no more open containers of liquid near the computer, and also that we leave the computer to dry out for three to four days. Can I tell you how addicted to blogging I am? When I was finally allowed to turn the computer back on, it was like saying hello to a long lost beloved friend. ONLY 3 DAYS, and I was missing my computer/photos/blog so much! Andrew shook his head at me. But let's move on! To treats! Specifically, treats in bags! Julia recently had her birthday, and as I was packing up goody bags for her party, it suddenly occurred to me that I'd done a fine job this year of assembling that birthday party staple - the goody bag. I'm kind of obsessed with party favors. I love the idea of them, because a bag filled with treats is Very Nice Indeed. I love the birthday etiquette dance of it all - you bring a present and then you get a bag of thank you treats! But.....sometimes I feel like goody bags just serve as a dumping ground for leftover Halloween candy or something. At the risk of offending anyone whose party I've ever attended, sometimes I find that they are filled with the most random of random. 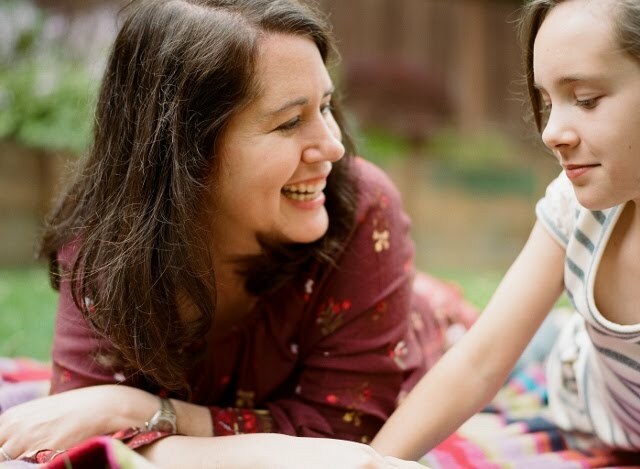 Not that my daughter cares. ANY goody bag is a fine goody bag to her. It could have paper towels and a stick of gum and she'd think that was fanflippingtastic. But I managed to delight myself with my collection of treats and when I delight myself, by golly, you guys are going to hear ALL about it! I discovered a few new things this year - purchasing some sets of items and breaking them up proved to be a more cost effective way of amassing treats than if I had bought everything individually. Also, the craft store is my friend sometimes. 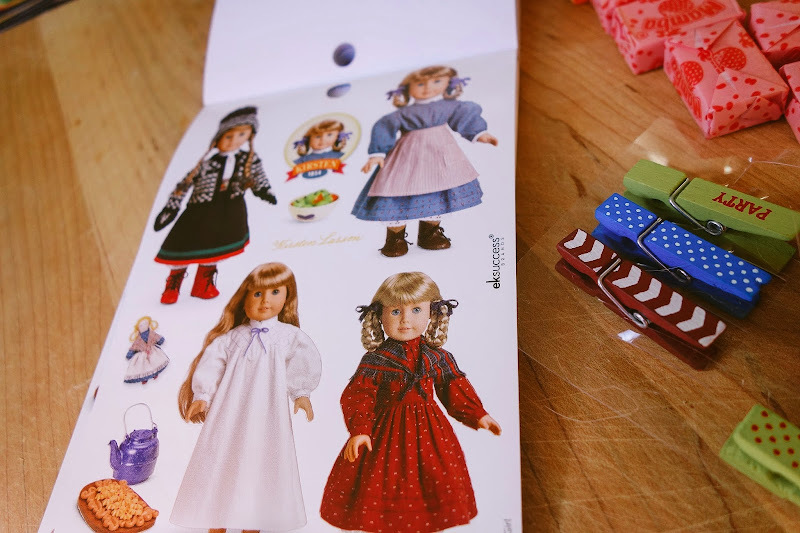 The American Girl doll sticker kit is SUPER cute - and comes with a ton of different sheets featuring the historical dolls - I just ripped out sheets and attached a sticker sheet to the back of each bag with a clothespin. 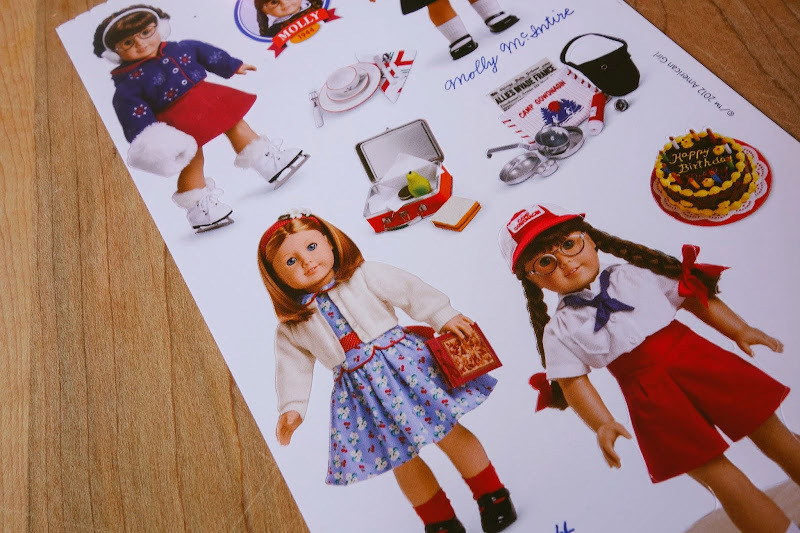 The whole sticker set would actually be an awesome gift all by itself. 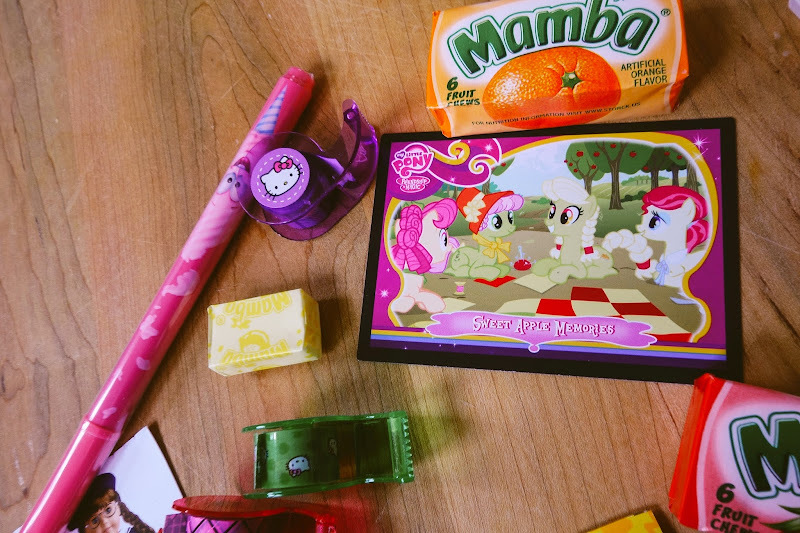 The Tapeffiti kit and the Mamba candy I found at Target. (the candy was in the dollar bin!) I'M OBSESSED WITH TAPEFFITI. 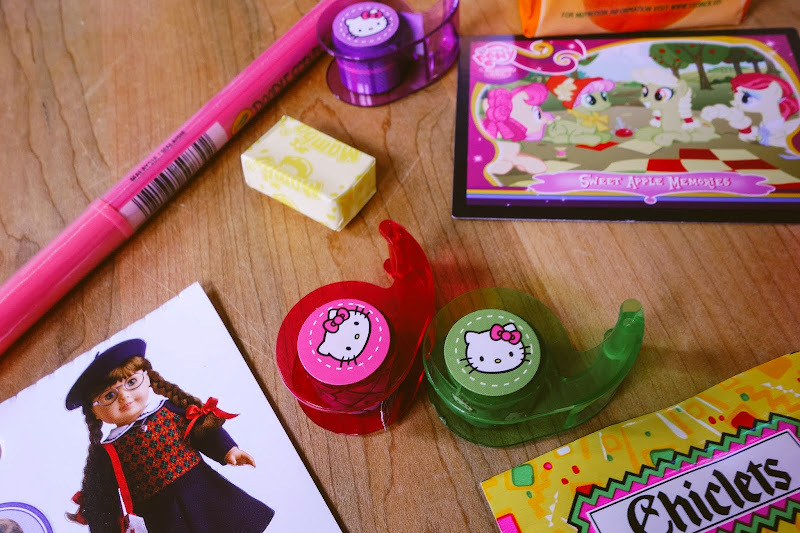 Giving the whole kit is one of my go-to birthday party gift ideas. No idea what a kid would like? Tapeffiti! BECAUSE WHO DOESN'T LOVE COLORFUL TAPE?? WHO?? 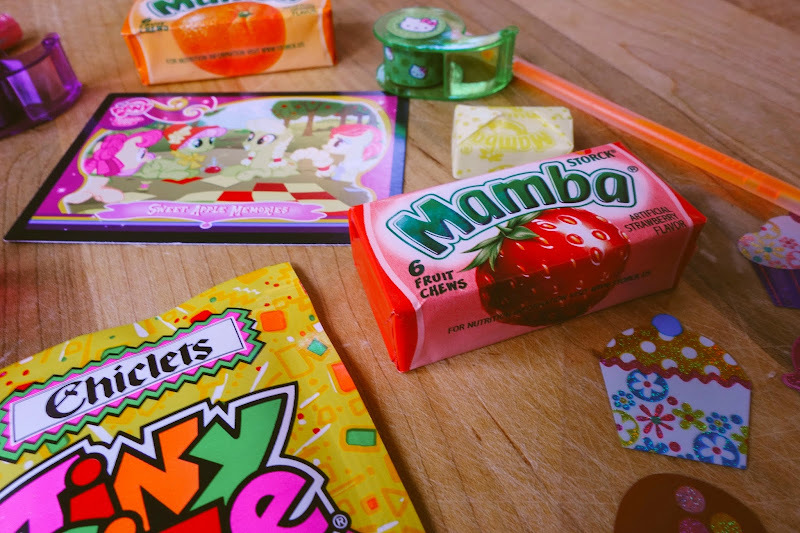 Mamba appears to be just basically a fancier looking version of Starburst candy, and I totally loved the packaging. I found the Tiny Size Chiclet gum at a local candy store - you might have to scout around a bit to find these, but they are seriously adorable, like rainbow gum that is sized for fairies. And the My Little Pony trading cards came as a pack that I found at the drugstore, and I just broke it open and put in one trading card into each bag. 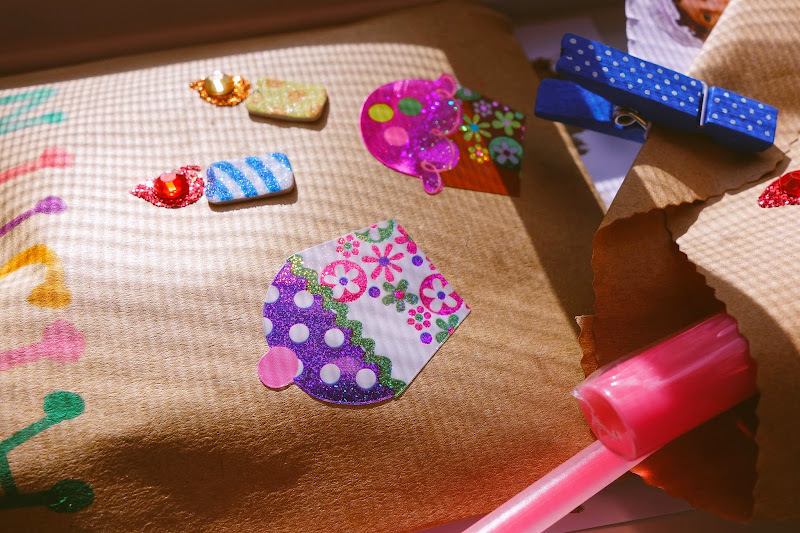 These cupcake stickers were seriously adorable! I thought they gussied up the paper bags quite nicely. I found the clothespins at the craft store - these are somewhat similar. Oh one last thing! 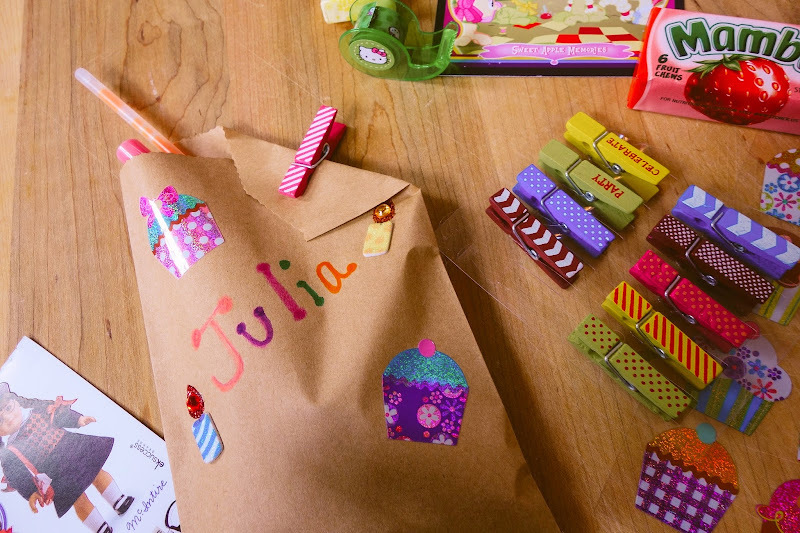 I also delighted myself with this idea, which we carried out a couple years ago - Julia had a sleepover birthday and I hid all the party favors around the house and the girls had a scavenger hunt to go find them. Each hiding spot had enough of each kind of treat to fill the girls' bags, and they had to hunt as a group. Well there you have it - I've just written more words about a party favor bag than I ever thought possible. #Blogging is hilarious. But seriously, if I were 9 years old and getting a goody bag, this is a bag I would have wished to receive. I'm very in touch with my inner 9 year old, (also my inner 13 year old) so I know what I'm talking about. I'd like to be in touch with my inner 23 year old because I think my body was in perfect health at that time with no aches or pains and that was awesome. You have inspired me for future parties - and I have a couple coming up. I think the scavenger hunt for the items is a good idea too! Thanks for sharing the goodies with all of us. The scavenger hunt went over BIG with the kids! Party favor awesome tip #34 - I found (where?? I can't remember where??) these plastic jewel rings that when you twist the top, they glow. Very superhero-y - the girls LOVED those! Loooove the idea for the scavenger hunt. 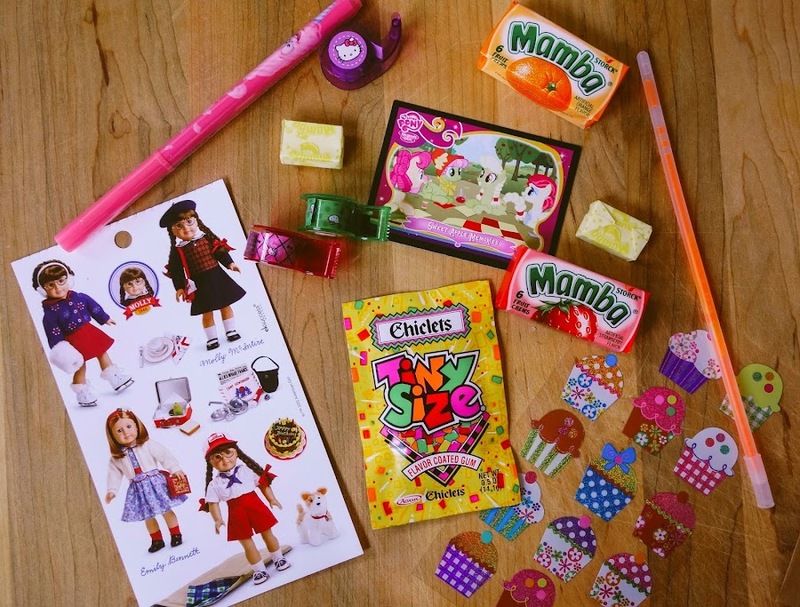 Plus, I would love this goody bag NOW! I thing there need to be party favor bags for grownups. I would be ALL OVER THAT. I'm basically in love with the whole idea of gift bags and gift boxes. One year I made a gift basket for my mom for Mother's Day. She barely glanced at it!!! She's not the most detail oriented person. I was so miffed, I was like, do you SEE my GIFT BASKET that I MADE?? And then I pilfered through half of it and took it home for myself. Haha I love this! And welcome back! I've missed your blog so much. What a fun goody bag! I love how much thought was put into it. Seriously, super cute!!! That is a truly excellent treat bag. I bet the other mothers are thinking they will have to up their game for their parties. nah, they're probably thinking 'this lady is bonkers for thinking this hard about kid party favors' ha ha ha! I always feel bad when J comes home from a party, tosses her favor bag onto the table and then leaves it there. I leave it alone respectfully for about 4 days and if she still hasn't touched it.....into the garbage it goes!